Among all other supplements marketed online, we are going to review one of best ones: Swisse Ultiboost Memory + Focus tablets. This product claims to contain gingko, vitamin B complex and brahmi to support cognitive function and beat mental stress. It claims to improve memory and mental performance, maintain healthy circulation, get rid of mental stress easily, and support healthy brain functioning. If you want to know more about Swisse Ultiboost Memory + Focus, read on. B- Vitamins: Vitamin B1 (thiamine hydrochloride), Vitamin B2 (riboflavin), Nicotinamide, Vitamin B5 (pantothenic acid from calcium pantothenate), Vitamin B6 (pyridoxine from pyridoxine hydrochloride), and Vitamin B12 (cyanocobalamin). These vitamins are essential in converting food such as carbohydrates, proteins and fats into energy. They are also needed for cognitive function and for optimum performance of the brain and the nerves. They help improve memory and mental alertness. Brahmi or Bacopa monnieri: Influences brain cells positively by promoting brain tissue regeneration. It can also help prevent against neurodegeneration which is associated in dementia. It also offers protection against stress and oxidative damage, which may be responsible for free radical production in the body. Gingko Biloba— Improves blood circulation in the brain and acts as an antioxidant that brings many benefits to the body. It can boost cognitive function and memory and may help prevent dementia progression. Swisse Ultiboost Memory + Focus tablets should be taken as one tablet two times a day, during or after meals or as prescribed by a health professional. The tablets should be stored below 30°C so as to prevent deterioration. Swisse Ultiboost Memory + Focus tablets is sold at a price of 50 Tablets RRP $29.95. There are no discounts or promos. The official website of Swisse Ultiboost Memory + Focus does not clearly state its guarantee conditions. But it states in its terms and conditions that when the product being delivered to you is in a damaged condition or faulty, you must notify them through the CONTACT US form in the website. If the products cannot be replaced and returned to you, the website claims to reimburse the purchase amount in your credit card including handling and postage fees. The lack of a clear guarantee may be a cause of concern and should be highlighted in their page because others may think that this is not a high-quality product. As for customer reviews, this products has some positive reviews because according to customers, the product contains much higher levels of brahmi and gingko biloba than other focus and concentration products in the market. The drawbacks noted by these customers is the size of the tablets (they are big tablets) and the smell (one consumer claimed it smells like hay). The size of the tablets actually matter because people with swallowing products such as the elderly cannot swallow the tablet very well and may cause problems. 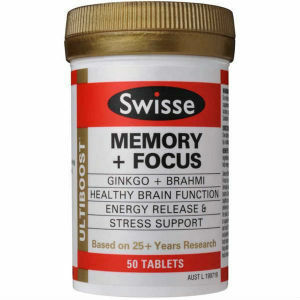 Overall, Swisse Ultiboost Memory + Focus is a good product because it contains a complete set of nutrients and herbs which are essential in boosting memory and cognitive function. It also has a higher concentration of brahmi and gingko unlike other similar products. The downsides are its huge tablet size and its smell. If only manufacturers would reformulate their product so that it can be taken easier, while offering a good guarantee, then this product may be considered top notch. Henry Costa	reviewed Swisse Ultiboost Memory + Focus	on November 16th	 and gave it a rating of 2.5.